People’s Palace Projects were hugely proud to be involved with the Olympic and Paralympic Cultural Forum 2013 this April in Rio. The Forum was executive produced by the British Council, Ministry of Culture and People’s Palace Projects, curated by PPP’s Paul Heritage and Cid Blanco (Olympic Public Authority), co-curated by Jude Kelly and was part of British Council TRANSFORM. It was a powerful few days that exceeded all expectations. 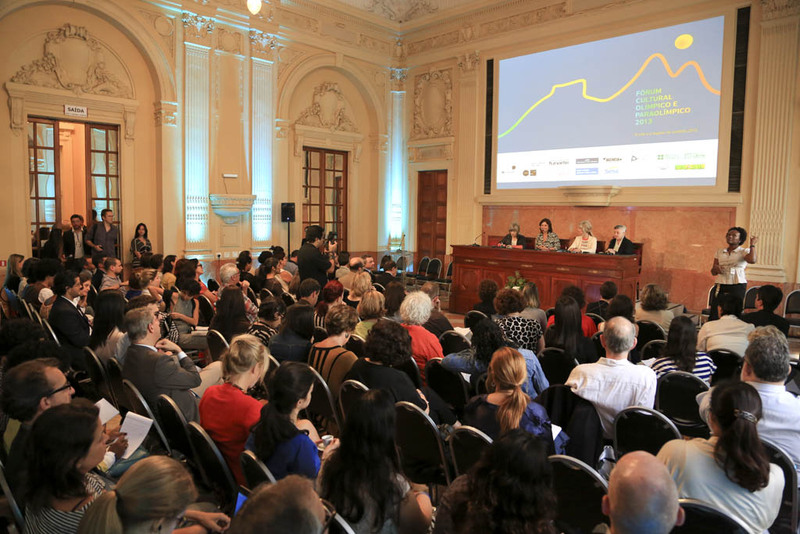 The Olympic and Paralympic Cultural Forum was created to stimulate discussion in the Brazilian cultural sector about the role of the arts in preparations for Rio 2016. At the heart of the Forum was an opportunity for key figures from the Cultural Olympiad and London 2012 Festival to share their experiences and reflections through formal presentations, working group discussions and informal networking. There were sessions on how the Olympics and Paralympics might promote community-based arts projects and the culture of the periphery; and how the Paralympics can promote cultural projects involving people with disabilities. Panel discussions were held on varying areas including The Role of the Artist: before, during and after the Games. Each of the three days had a session dedicated to the Paralympics. The Forum was connected to the showing of work at Sesc Madureira by artists featured in the 2012 Unlimited Festival and finished with a performance of work by artists with disability at Galpão Gamboa. 280 individual delegates attended the three days of the Forum. By working closely with Agência de Redes para a Juventude, the Forum attracted over 100 young people to learn about the experience of London 2012 and participate in the debates about Rio 2016. Alongside the core programme ran a series of alternative visits, intended to provide a context for understanding cultural practices in Rio’s peripheral territories and to connect with the transformative arts methodologies that offer alternatives to existing British practices. Groups visited some of the following organisations: Grupo Cultural AfroReggae, Spectaculu, Circo Crescer e Viver, Agência: Redes para a Juventude, Redes da Maré, Lia Rodrigues Dance Company and Bela Maré. The UK delegation at the Forum included: Arts Council England [Moira Sinclair, Executive Director London and South East]; Calouste Gulbenkian UK Foundation [Andrew Barnett, UK Director; Isabel Lucena, Programme Manager];? Creative Scotland [Leonie Bell, Creative Programmer]; LOCOG [Ruth Mackenzie CBE, Director of the Cultural Olympiad London 2012; Nigel Hinds, Creative Producer; Jenny Waldman, Creative Producer; Francesca Canty, UK Cultural Programme Advisor] Greater London Authority/Mayor of London [Justine Simons, Head of Cultural Strategy]; Livity [Michelle Clothier, Managing Director; Anna Hamilos, Group Account Director; Jiselle Steele, Regional Team Manager]; London Legacy Development Corporation [Sarah Weir OBE, Director The Legacy List; Adriana Marques, Arts and Culture Principal]; host cultural venues [Jude Kelly OBE, Artistic Director Southbank Centre; Dawn Reid, Associate Director Theatre Royal Stratford East], small arts organisations/producers [Jenny Sealey MBE, Artistic Director and Amit Sharma, Associate Director Graeae Theatre; Matthew Peacock MBE, CEO Streetwise Opera]. The Cultural Olympic and Paralypic Forum and Unlimited Festival were only made possible through essential partnerships between British Council, People’s Palace Projects, Olympic Public Authority of Brazil, Ministry of Culture, FUNARTE and SESC-Rio, and generous support from the Arts Council England, Creative Scotland, Queen Mary, University of London and the Agency of the Networks of Young People. Photograph shows panel from L-R: Jude Kelly, Adriana Rattes, Justin Simons and Ruth Mackenzie.